Let's consider the linear feature space for both SVM and LR. SVM is deterministic (but we can use Platts model for probability score) while LR is probabilistic. Linear SVMs and logistic regression generally perform comparably in practice. 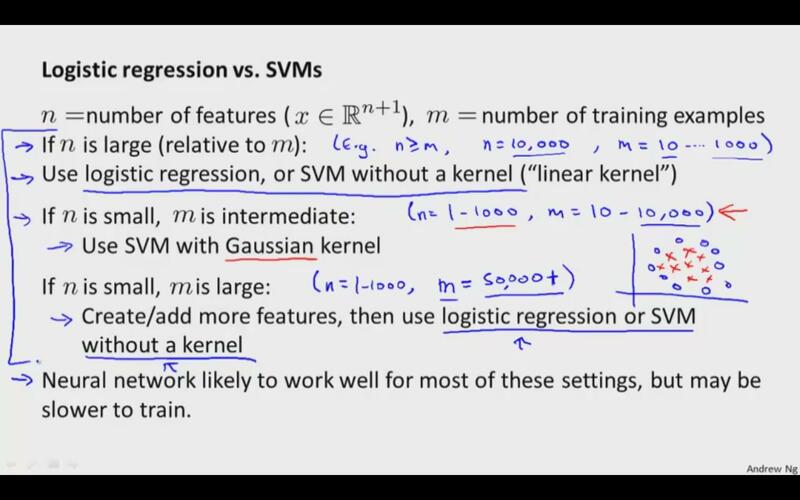 Use SVM with a nonlinear kernel if you have reason to believe your data won't be linearly separable (or you need to be more robust to outliers than LR will normally tolerate). Otherwise, just try logistic regression first and see how you do with that simpler model. If logistic regression fails you, try an SVM with a non-linear kernel like a RBF. Ok, let's talk about where the objective functions come from. The Support Vector Machines algorithm is much more geometrically motivated. Instead of assuming a probabilistic model, we're trying to find a particular optimal separating hyperplane, where we define "optimality" in the context of the support vectors. We don't have anything resembling the statistical model we use in logistic regression here, even though the linear case will give us similar results: really this just means that logistic regression does a pretty good job of producing "wide margin" classifiers, since that's all SVM is trying to do (specifically, SVM is trying to "maximize" the margin between the classes). this picture comes from the coursera course : "machine learning" by Andrew NG. It can be found in week 7 at the end of: "Support vector machines - using an SVM"
LR gives calibrated probabilities that can be interpreted as confidence in a decision. LR gives us an unconstrained, smooth objective. LR can be (straightforwardly) used within Bayesian models. SVMs don’t penalize examples for which the correct decision is made with sufficient confidence. This may be good for generalization. Check out Support Vector Machines vs Logistic Regression, University of Toronto CSC2515 by Kevin Swersky. Not the answer you're looking for? Browse other questions tagged regression logistic svm optimization or ask your own question. How can SVM 'find' an infinite feature space where linear separation is always possible?